Note: Diamond Club also receive discounted price ($5 Clubhouse, $3 Stretch Run) on Opening Day. Scan your barcode at admission gates to receive the discount. Download the Del Mar Mobile App and sign up with a valid email address to unlock membership perks. Keep an eye on our events calendar and your email! Diamond Club members get frequent perks at the track including exclusive giveaways, food & beverage discounts, attendance rewards and special events. Note: You must be a Diamond Club member and scan your membership card at designated Admission Gates and Concession stands to access perks. Every Thursday, all Diamond Club Seniors 62 and over receive FREE Stretch Run admission when they present their cards and I.D. at the Stretch Run Admission Gates. Not a Diamond Club member? Every Thursday in the fall and select Thursdays in the summer are open to all seniors 62 and over. Turn your Diamond Club membership into a wagering account to use at any self-service machine or from your smart phone. After your account is activated, simply load funds on your account and avoid the hassle of losing tickets or waiting in line! More Info. Please review the Diamond Club Membership Rules for program terms and conditions. Diamond Club membership is subject to the terms and conditions established periodically by the Del Mar Thoroughbred Club. 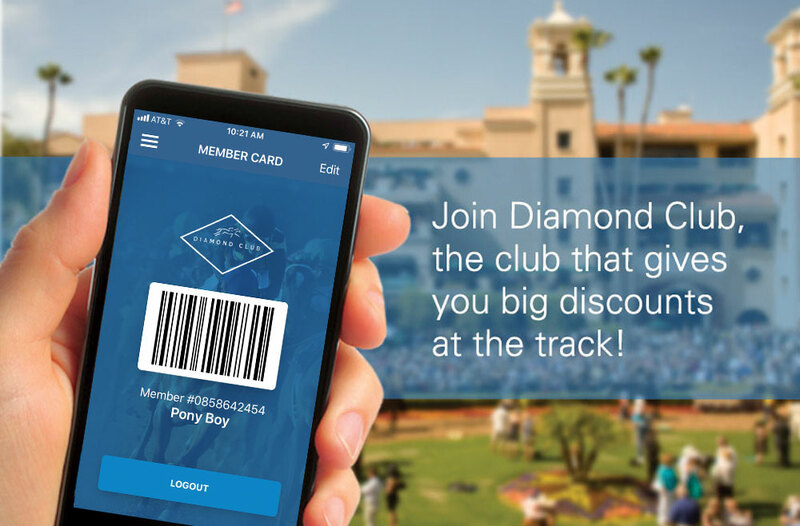 The Diamond Club card is the property of the Del Mar Thoroughbred Club and must be surrendered upon request. Photo identification may be required upon use of this card. The Diamond Club card is non-transferable and may be used only by the person who signed up for the card. Limit one membership per person. Use of the Diamond Club card by those other than the owner may result in immediate confiscation and cancellation. Diamond Club offers are subject to change without notice. The Del Mar Thoroughbred Club reserves the right to charge a replacement fee for lost, stolen or mutilated cards. All DMTC, SSRP and any of their affiliates are not eligible for membership nor any special offers associated with the Diamond Club. Complete rules available on request.